Bamboo has long been a symbol of Asia and the countries of Southeast Asia. 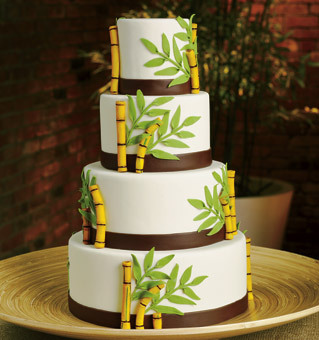 In China, it is considered to be a symbol of longevity, which makes bamboo a very fitting motif for a wedding. Not only is bamboo culturally important and beautiful to behold, it is also one of the most sustainable and renewable plant resources, so it is an excellent choice to include in an eco-friendly wedding. As with any wedding, one of the places to start is with the invitations. It is now possible to have your wedding stationery created on gorgeous bamboo paper. The bamboo paper is ideal for the letterpress styles that are so popular these days. Bamboo has several environmental advantages over the cotton rag paper traditionally used for fine stationery. For one thing, it can be grown without pesticides, unlike the cotton used for paper; for another, bamboo requires very little water, making it an ideal choice for brides who want beautiful paper that is also "green". Bamboo is not only fantastic for paper, it can also be used to create lovely fabric. The truly eco-conscious bride can consider gowns created from bamboo for herself and her bridesmaids. There are some beautiful styles available for all of the women in the wedding. Your bamboo bridal gown can be accessorized with handmade jewelry sets. Look for sets of bridal jewelry that are created from dazzling Swarovski crystals, which are a better choice for the environment than diamonds. 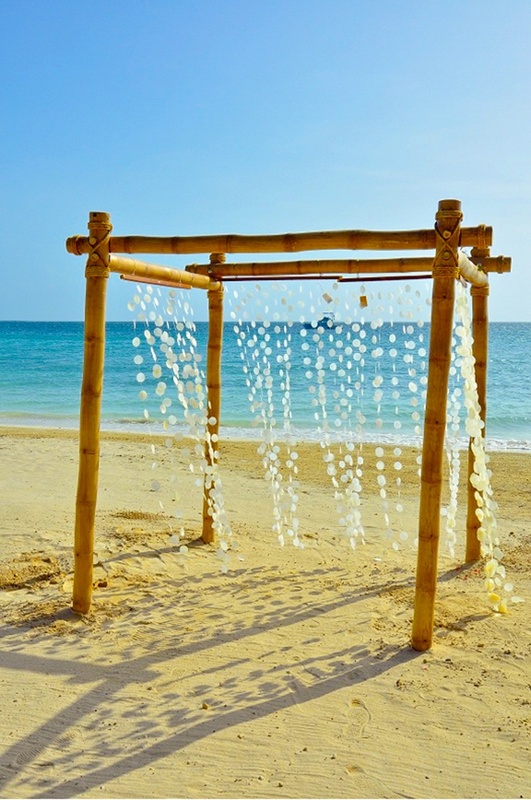 There are many other wonderful ways to use bamboo in a wedding. It can be highly decorative, and is a very pretty natural design element. 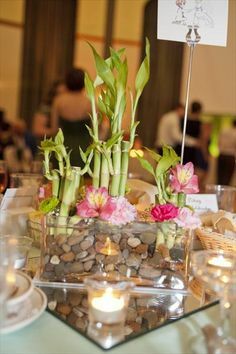 Create Asian inspired centerpieces with elements such as tall stalks of bamboo, pebbles, and graceful floating flowers. 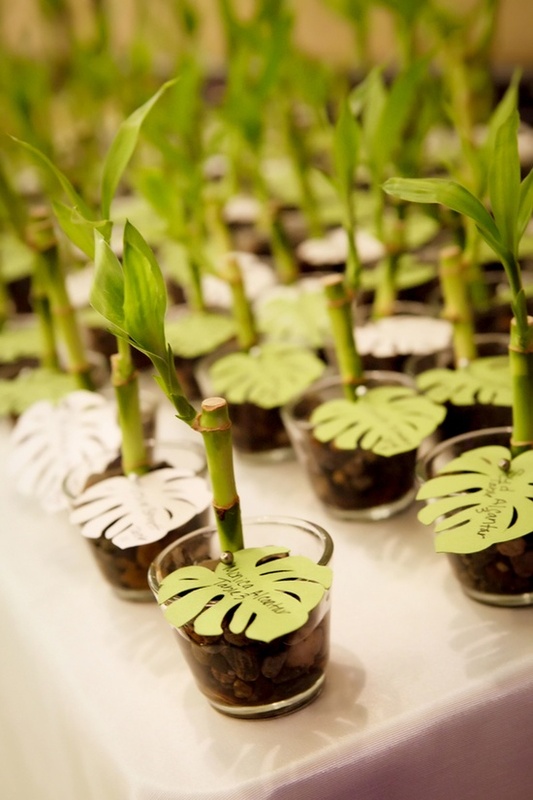 Lucky bamboo in planted in tiny ceramic pots is also a very modern and hip idea for your wedding favors. Think about other ways that bamboo can add style to your reception. For instance, bamboo chargers under the place settings are a chic alternative to heavy gold chargers. An ugly corner in a reception venue can be camouflaged with tall stalks of bamboo. The list of possibilities is nearly endless once you set your mind to it. Bamboo is also a terrific motif to use as a design element. Think about using it as a decorative element on your invitations and other wedding stationery. The bamboo motif also works on anything from cocktail napkins to little favor boxes. It would be very nice to include a brief note in your wedding programs explaining that bamboo represents longevity. When you are incorporating bamboo into your wedding, don't forget about the menu. There are many wonderful dishes from Asia and Southeast Asia that feature bamboo shoots. It has a mild flavor that makes it a very versatile ingredient in everything from soups to salads to main courses. 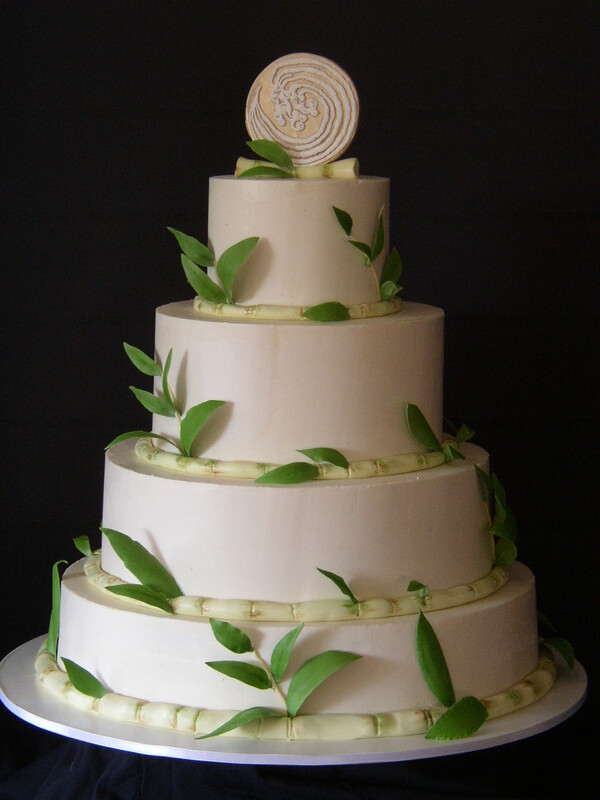 You can also design a very stylish cake with bamboo created from fondant or sugar. Bamboo is a cutting edge material that has a lot to offer your wedding. It looks great and is great for the environment, which makes it a super element to include in your festivities. Whether you want to have an eco-conscious wedding or just a chic one, bamboo is a fantastic thing to use.